Directions: From Jalan Kuching northbound, keep left when you approach the Segambut Interchange. Turn left (9 o'clock on the roundabout) into Jalan Duta. Go pass the Tennis Stadium on your left and turn left when you see the entrance to the Hockey Stadium. If you are approaching from the opposite direction from Jalan Damansara via Jalan Duta, is best to do the U-turn at the roundabout. 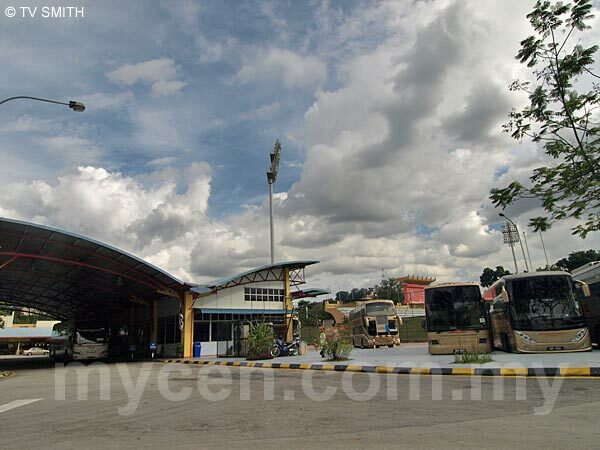 Update: In conjunction with the temporary closure of Puduraya for four months from 19th Mar 2010, a RM 2 shutter service is to be provided between Hentian Duta and the temporary Terminal Bas Hang Tuah near Puduraya. Flip-Flop Update: At the last minute, the announced closure was postponed to an undisclosed date. Info / Insights: Bus terminal serving mostly express buses from the Northern states. (For buses to and from the East Coast states - see Hentian Putra. For southbound buses, see Hentian Puduraya and for KL-Singapore buses see Hentian Rakyat). Most of the buses at Hentian Duta are operated by Transnasional. Parking charge (minimal of RM 1) is imposed even if you enter for 30 seconds to pick up a passenger. If you are unfamiliar with the city, you will feel you have ended up in the middle of nowhere. This terminal is very remote and inaccessible by other public transport. Cabs and touts are freely available within the premises though. Position on Google Earth: View MyCen Location (what's this? ).